I am finally able to comply with the request of several of our readers! Michelle spotted this little beauty while watering our vegetable garden. A frantic dash for the camera bag, and the image of the little one could be added to our collection. 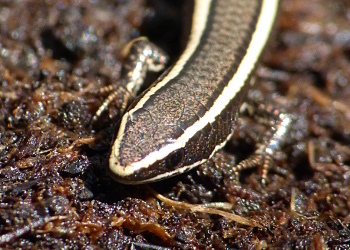 And here it is, the Striped spectacled tegu, or Kolebra di mispel (Gymnophthalmus lineatus). Thus little lizard has a very cryptic way of life, spending most of its time hidden in leaf litter. This is no surprise, because its small size makes it the perfect snack for bigger lizards, and some birds as well. It feeds on small insects. It clearly has legs, but these are reduced in size, hence giving the animal a snake-like appearance, hence the name in Papiamentu (Mispel snake). Another member of Curaçaos surprising fauna! Several of our readers expressed concern, being under the impression that the population size of this species has dwindled. Unfortunately no research has been done to establish a ‘baseline’ nor is anyone doing any research on these little critters at this moment in time, so it is impossible to address this concern in a scientific way. On the other hand, the animals are so cryptic that one can easily overlook them, and most of us are not in the habit of rummaging through leaf litter on a daily basis. I am very happy, though, to have encountered one in our garden once again. The last time I got the chance was over 2 years ago. Around that time I spotted them on a weekly basis, and even in bigger numbers while they were being playful in the name of reproduction. It makes you wonder if the “white powder”, belched out by Curaçaos infamous refinery some time ago (we live semi-downwind of this antiquated relic), was as inert as we were assured it was.